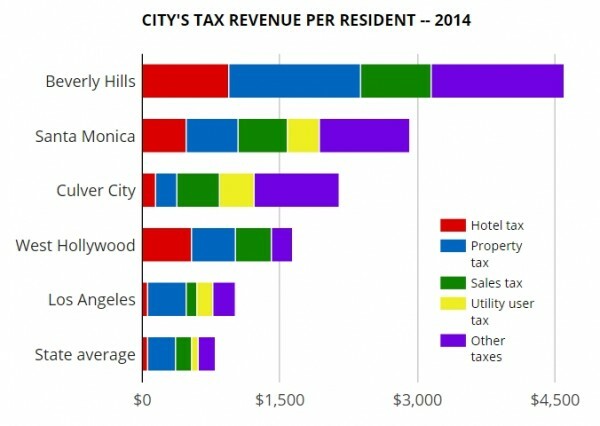 West Hollywood collected more tax revenue per resident in 2014 than 93% of California cities. That’s according to a new analysis of data from the State Controller’s Office (SCO) by WeHo by the Numbers. More than half of the city’s revenue comes from taxes. According to the SCO numbers, West Hollywood collected $1,639 in tax revenue per resident in 2014. That was more than twice the average of $776 for California’s 482 cities and towns. West Hollywood had 60% more tax revenue per resident than Los Angeles ($1,019). However, West Hollywood’s tax revenue per resident was about a third of Beverly Hills’ ($4,595), roughly half of Santa Monica’s ($2,920), and three-quarters of Culver City’s ($2,152). In some cases, the SCO numbers may differ from a city’s audited financials. One-third of West Hollywood’s tax revenue in 2014 was from the transient occupancy tax (TOT), also known as a hotel or lodging tax. Only 16 cities got a bigger share of their tax revenue from hotel taxes. West Hollywood collected $541 per resident, almost 10 times the statewide average of $58. That put the city in the 97th percentile among California cities. West Hollywood’s tax revenue includes a share of the property taxes paid here. Based on SCO data, the city was in the 89th percentile for property tax revenue per resident in 2014. 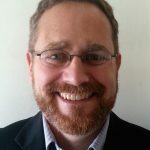 The amount was $476, well above the $306 statewide average. West Hollywood also gets part of the sales and use taxes paid here. In 2014, the revenue per resident was $393, more than double the statewide average of $180. It put the City in the 90th percentile. West Hollywood’s tax revenue includes other levies, such as the business license tax. The 2014 amount of other tax revenue per resident was $228, more than the statewide average of $187. Among California cities, West Hollywood ranked in the 85th percentile. West Hollywood doesn’t have a utility user tax. For more information, please see the Weho by the Numbers article, How does West Hollywood’s tax revenue compare to other cities? Seems less to do about WeHo specifically than the fact that WeHo happens to be part of a core of affluent Westside L.A. communities. What strikes me more is how the affluent communities of Central and Northern California don’t spike up the numbers for the state average. Are their cities running things that much differently than we are here? ahhh, something for every confiscatory liberal to be proud of. good on you. but lets make sure we do nothing for the homeless.